The ministry of New & Renewable Energy (MNRE) has done commendable work in terms of conceptualizing, drafting, launching and implementing the Jawaharlal Nehru National Solar Mission over the last year and a half. The year 2010 will be marked as the year when Jawaharlal Nehru National Solar Mission (JNNSM) was launched in all earnestness. The Mission has already started showing signs of great promise for the future - in terms of up-scaling and mainstreaming the use of solar energy as a sustainable source to address the intertwined issues of enhancing India’s energy security and helping mitigate global warming and climate change. The JNNSM targets of generating 20,000 MW of grid connected and 2000 MW of off grid solar power by 2022 are truly impressive. By following the global experience of connecting solar power to the grid through megawatt scale solar power plants, India has joined the global solar bandwagon in a big way. The Ministry of New and Renewable Energy (MNRE) has done commendable work in terms of conceptualising, drafting, launching, and implementing the JNNSM over the last one year along with the Ministry of Power (MoP). The National Th ermal Power Corporation (NTPC) has played a key role through the NTPC Vidyut Vyapar Nigam (NVVN) in organising the short listing of the applicants for setting up large solar projects in phase 1 of the JNNSM (January 2010 - March 2013). Similarly, the Indian Renewable Energy Development Agency (IREDA) has played a vital role as the nodal agency for selection of applicants for the up to 2 MW capacity, rooftops PV and small solar power generation programme (RPSSGP). Of course, all these initiatives would not have been possible without the pivotal role of the Central Electricity Regulatory Commission (CERC) which came out with a levelised tariff for the solar power plants. This became the basis for the solar tariff set by the State Electricity Regulatory Commissions (SERCs) and in many cases the SERCs decided to emulate the CERC tariffs. It is laudable that all these government ministries and agencies worked in tandem to launch the first set of large commercial plants under the JNNSM and it is creditable that we have some 900 MW of solar power plants already underway in the first year of the Solar Mission. MNRE suggested allocation of 60 per cent of the projects in the Mission for concentrated solar thermal (CST) and 40 per cent for solar photovoltaic (PV) technology, in its effort to try out other technologies. After discussion with the Indian solar industry, the government has adjusted the allocation to 50-50 between thermal and PV. In India, the PV technology has established itself over the past two decades and there are some 40 manufacturers of solar PV modules in the country today. In comparison CST technology is yet to develop a manufacturing base. The Government can validate CST in the Indian context by way of demonstration projects and subsequently on a commercial scale. While there are specific advantages for PV, such as its ability to be applied at micro scale in terms of individual products like solar home lights and lanterns as well as at rooftop PV systems and megawatt scale plants; CST also has its advantages such as its capability to hybridize with gas and other sources and the capacity for power storage, though the costs for storage are prohibitively high at present. Th e government went for reverse bidding for the 5 MW PV projects totalling 150 MW and for the 10-100 MW CST projects totalling 470 MW. Th e bidding was organised by NVVN based on highest discount offers. This resulted in aggressive bidding and the resultant tariff s of Rs 11 to 12.50 per kWh are as much as 30-40 per cent lower than the CERC tariff of Rs 17.91, which was set after due diligence and taking into account the Indian and global solar industry data as well as discussion in an open public hearing. The aggressive bidding has enabled new enthusiastic players to enter the Indian solar market, who can seek assistance from the Ministry and banks for funding as well as technology, for the success of the JNNSM. Th e Ministry may look at addressing the gap in solar tariff in the next round of bidding. CERC tariff s for the whole country can be adjusted region wise such that eastern and north eastern parts of India also receive solar investments. The Ministry has mandated use of indigenous PV modules in Phase 1 of JNNSM. Th is proviso will be extended to the use of indigenous cells in the next phase. The move has been welcomed, since it gives a level playing fi eld to the Indian PV manufacturing industry. Th e proviso applies to the use of crystalline silicon (C-Si) modules - an established technology accounting for 85 per cent of the global market. However, import of non C-Si modules like thin fi lm (amorphous silicon, cadmium telluride etc.) have been possible. This has led to a situation where the overstretched-for-low-cost projects in the NVVN list may import thin film technology without considering the long term sustainability and performance guarantee of the projects. The provision is necessary to attract further investments for the manufacturing of solar PV into India. The numerous announcements made by Indian and foreign players to start PV manufacturing in India show that the move is in the right direction. The state governments, which are implementing ambitious solar power plans, should be encouraged to include a ‘Made in India’ clause in their respective policies. 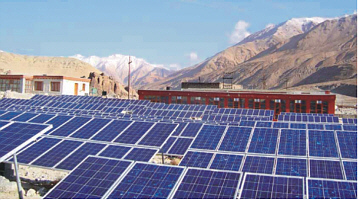 The Ministry’s idea to create a range of channel partners like system integrators, banks and micro finance institutions (MFIs), NGOs, financial integrators and renewable energy service companies, apart from the State Nodal Agencies (SNAs), to implement off grid projects and obtain subsidy directly from the MNRE is a good one. It augments the process of implementation of the off grid segment of the JNNSM which foresees a target of 200 MW in Phase 1 and 2000 MW by 2022. Th ese channel partners will have to get themselves rated or accredited through agencies appointed for the purpose (CRISIL or ICRA etc.) and based upon the rating they can submit their project proposals. Each project proposal can accumulate diff erent off grid initiatives totaling 1 MW at a time. This is a sound idea to effectively and efficiently get projects implemented. However, the critical factor for success will be the speed and ease with which the channel partners get their payment from the government. One suggestion is to make the entire transaction online, including submission of project proposal to MNRE’s committee, tracking of the application, and finally payment of the subsidy to the channel partner/ beneficiary - so that human interface and consequent delays are eliminated. Off grid and de-centralized renewable energy applications are the most appropriate for a vast and rural country like India where the grid cannot be extended everywhere. We have the successful example of Chhattisgarh where almost 900 village level micro plants are running on solar energy for the last 2 to 3 years. This model can easily be extended to the neighboring states of Bihar, Jharkhand and Orissa where the conventional electricity supply in rural areas is similarly hindered. Further, there is the example of Uttar Pradesh where one company has sold more than 1,10,000 solar home lighting systems. Th is can be amplified to cover all un-electrified households in the country. This is sought to be achieved by roping in regional rural banks through the National Bank for Agriculture and Rural Development (NABARD) - another welcome step. The inaugural year of the JNNSM was perhaps rightly spent in getting the first batch of projects off the ground but in its second year the Mission must focus on some core and essential areas such as capacity building and promoting research and development. The MNRE has recently prepared a human resource development plan for the renewable energy sector. This should be implemented in earnest through close cooperation with the Indian industry because shortage of trained and skilled manpower is already being felt by the Indian solar industry due to its current relatively small size. One of the most important targets for JNNSM is to achieve grid parity of solar power by 2022. This is sought to be accomplished by generating large volumes to drive down costs by bringing in the play of Economies of scale in manufacturing and project implementation. The second aspect of this strategy has to be result oriented technological research and development. The JNNSM document talks about setting up a national council to promote solar research. Th ere is no doubt that there is a need to enhance the level of research to find new materials, improve efficiency of the existing ones, reduce the cost and improve the efficiency of balance of systems (BOS), optimize solar power through tracking mechanisms and make storage of power cost effective and long lasting etc. The government can come out with another policy like the Special Incentive Package Scheme (SIPS) which allows for 20-25 per cent grant for the setting up of solar PV manufacturing, subject to a minimum investment of Rs 1000 crore. The new policy should be pegged at lower threshold levels and must include poly-silicon and wafer manufacturing as well as BOS. Hopefully, 2011 will be the year when solar products and systems will become a consumer item, which can be bought off the shelf in shops and markets. For this to happen, it is essential that the respective regulatory agencies fix solar rooftop tariff s and the respective state governments extend support in the form of capital subsidies to make rooftop solar power systems affordable. If this is done in mission mode, individual consumers will be incentivised to start setting up their own rooftop solar power plants, as has been the experience in Germany. This idea could help solve the current problem of 12 per cent demand supply gap in the power sector. The first year of the Solar Mission has been an eventful one. We need to keep up the momentum with the immediate goal being the timely and successful achievement of the Phase 1 targets and the next goal being to prepare for Phase 2 based upon the experience and learning from Phase 1. If all of us, from the industry and government join hands with a positive and proactive approach, we can surely achieve it.